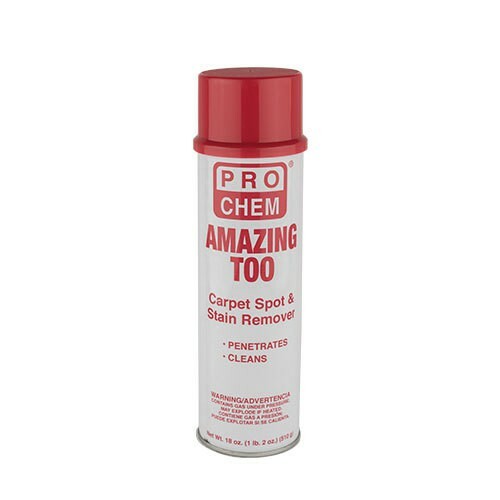 Amazing Too | Pro Chem, Inc. This product is a uniquely formulated product with a blend of effective dry and wet cleaning compounds and degreasers that quickly remove spots and stains. Penetrates and cleans without leaving residue. Brightens as it restores nap and texture. Can sprays upside down only. Remove protective cap. Shake well. Hold can upside down. Point opening in spray tip towards spot or stain. Depress the tab on the top of the spray tip to spray. Hold can at arm’s length. It is not necessary to bend down to apply this product. Apply in short bursts until spot or stain is covered. Allow a short period of time for spotter to penetrate stain. Blot spot with a clean cloth working from center of stain out. Stain or spot will be gone in seconds. Excessive deposits of grease, oli or ink may require additional applications. Wait until material is dry before reapplying.